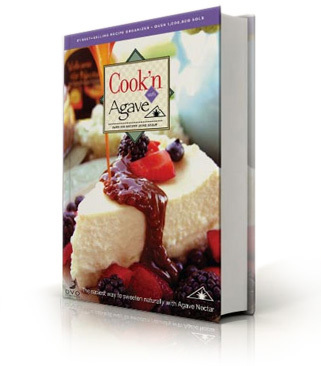 Cook'n with Agave CD + 1 Free 24oz Bottle of Agave! Cakes: One-half of the sugar in a cake recipe can be replaced with agave nectar. For every 1 cup of sugar replaced, leave out 1/4 cup of liquid. Cookies: The amount of sugar that can be replaced with agave varies with the kind of cookie being made. For brownies, half of the sugar can be replaced with Agave Nectar. For fruit bars, agave syrup can replace two-thirds of the sugar called for in the recipe. Only one-third of the sugar can be replaced in gingersnaps. When making either cakes or cookies, first mix the agave syrup with the fat or the liquid. Then mix it thoroughly with the other ingredients. If this is not done, a soggy layer will form on the top of the baked product. If your recipe doesn't fall under the above categories, you can try using 1/3 cup of Volcanic Nectar agave to replace 1 cup of sugar. Products made with Volcanic agave nectar brown faster than foods made with other sweeteners. So when you bake products made with Volcanic Nectar agave, set the oven temperature 25 degrees F lower than what is indicated in the recipe. Over 400 Volcanic Agave Nectar recipes to satisfy and delight your taste buds.